In our last post, I walked through the Whole Life Offering diagram shown to the left (click the diagram to pull up a larger version). Today, we’re going to focus on the orange icons near the middle. These icons represent the Works of Mercy; the ways in which we love our neighbors. They are the external part of ministry for each and every Christian. Why do we start by talking about the Works of Mercy instead of the Works of Piety? Why do we talk about loving our neighbor before we talk about loving God? These 10 Works of Mercy are the ways Christ calls us to love our brother and, in so doing, we see clearly how Christ first loved us. In the history of the church there are different lists of Works of Mercy; some lists are shorter—they may have 9 or 8 works. Some lists are longer. They’re not all the same but this list is pretty common among all of the church leaders through history. These are the 10 ways of loving our neighbor that Jesus commands us to do in order to mirror his love into the world. One of the Works of Mercy is Sharing Your Bread. Have you ever noticed how the Bible never tells us to feed the poor? Instead it says, “Share your bread.” If I feed the poor I can just hand out frozen turkeys or bags of canned soup. But if I share my bread it means I have to actually be eating a meal together with someone. The point is this: with each of these works, the words are chosen very carefully – the wording indicates the way we are commanded in the Bible to do these things. We’ll define each of these in the weeks and months to come. But for now I want you to turn your attention to the outer set of seven items. These 7 are the Works of Piety. They’re the internal spiritual preparations; the ways that we love God. These 7 areas are all about spiritual development inside of us. The first is Searching the Scriptures. The second one, Learning, is about how the church, across history, has faithfully interpreted and carried out the Word of God. Then there’s Worshipping, Praying, Self-Denial, Serving, and Giving. Each of those builds on top of the other, meaning that we start first by Searching the Scriptures, and then we Learn about what the church can teach, then we Worship, etc. In other words, for the Work of Mercy of Sharing Your Bread, we need to Search Scripture about sharing your bread, Learn from church history about sharing your bread, Pray specifically about sharing your bread, incorporate sharing your bread into your family’s worship, and so on. 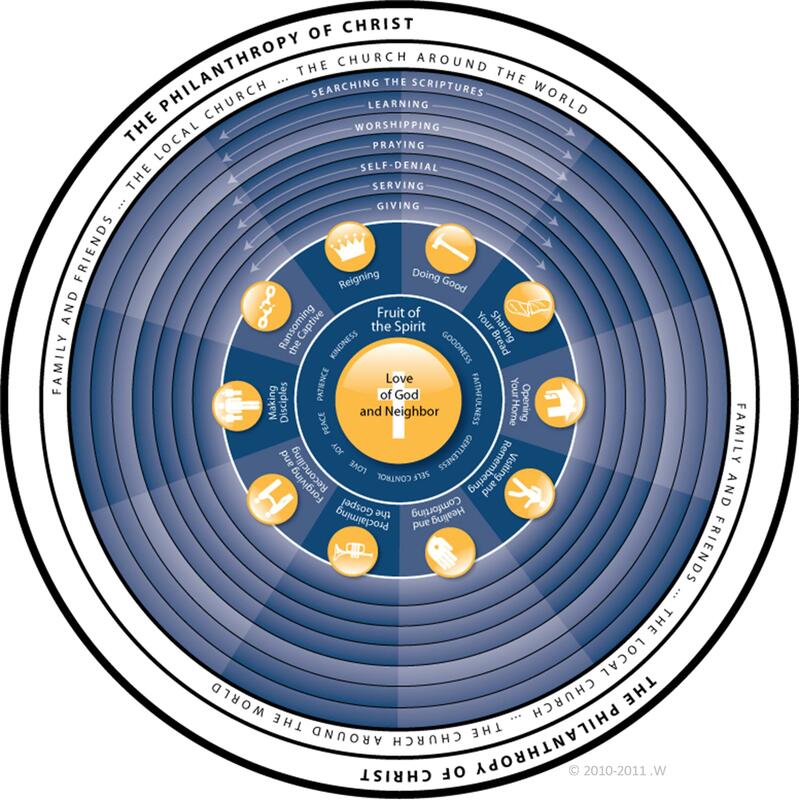 Now, there’s one last circle in the diagram that I didn’t cover on Friday: the fruits of the Spirit. The question is: where does the fruit of the Spirit come from? How does it develop in our lives? The answer is: from the outside in. That is, by the love of Christ, in the fellowship of our family, local church, and the church around the world, as we hear and do the word together. The fruit of the Spirit, in other words, is the product of the whole life offering, the result of comprehensive discipleship. That’s basic, Scriptural growth for the believer. This entry was posted in Uncategorized and tagged Christianity-as-Philanthropy, Comprehensive Maturity, Discipleship, Whole Life Offering, Works of Mercy, Works of Piety. Bookmark the permalink.